Background: The mycophenolate mofetil is an immunosuppressant drug with wide application in the treatment of cancer and prevent rejection in organ transplantation. This drug showed many sides effects for pregnant women and determination of this drug is very important in the human body. 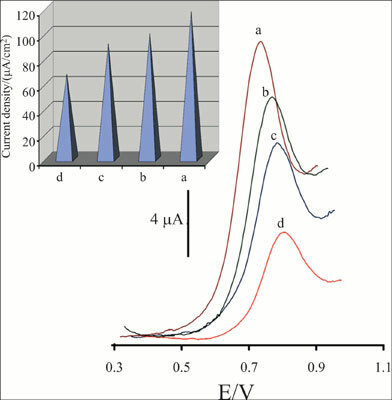 Objective: A new electrochemical strategy was described for analysis of Mycophenolate Mofetil (MMF) using novel voltammetric sensor. The sensor was fabricated using NiO/SWCNTs and 1-methyl- 3-butylimidazolium bromide as two conductive mediators for modification of carbon paste electrode (NiO/SWCNTs/MBBr/CPE). The NiO/SWCNTs/MBBr/CPE can be used for analysis of MMF in aqueous buffer solution in the concentration range of 0.08-900 µM. In addition, the NiO/SWCNTs/ MBBr/CPE reduced oxidation over-potential of MMF ~ 80 mV and increased the oxidation current of MMF ~ 2.85 times. In the final step, NiO/SWCNTs/MBBr/CPE was used for determination of MMF in pharmaceutical serum and tablet samples. NiO/SWCNTs, mycophenolate mofetil, 1-methyl-3-butylimidazolium bromide, electrochemical analysis, drug samples, carbon paste electrode modified.